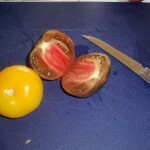 Cut tomatoes in 2, core and clean by removing seeds and juice. Chop the tomatoes into very small pieces and transfer into a colander and sprinkle with some salt (this will help draw out excess moisture). After 20 minutes or so, transfer to a bowl and add the garlic, basil, oregano, red chili peppers, olive oil and a drop of wine vinegar. Cover and leave to marinate at room temperature for another 30-60 minutes. Toast the bread just before serving. 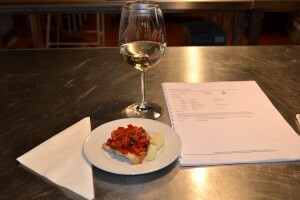 Arrange the bread on individual plates, top with the tomato and garnish with a whole basil leaf and serve immediately. 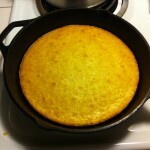 Corn bread! Great as a side for bbq, soups, or holiday dishes. 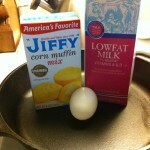 This is a simple recipe for corn bread using an iron skillet in the oven. 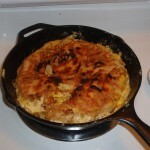 You can also use this same recipe for cooking the corn bread on the grill using the skillet. Preheat the oven to 400 and mix the ingredients together in a bowl and set aside for a few minutes. 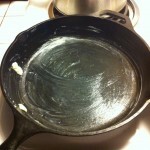 Coat the inside of the iron skillet (we use a 10 inch) with butter. 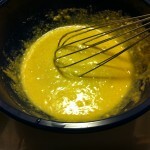 Give the batter a quick mix after it has sat for a few and pour contents into the skillet. Bake at 400 for 25 minutes or until golden brown. Corn Bread Ready to Go! Combine first five ingredients and 1/4 cup of water in a skillet. 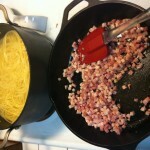 Cook over medium-high heat so the water evaporates and the bacon/pancetta crisps; about 12 minutes. If using pancetta, you may want to crisp it slightly before adding the water and other ingredients just to give it a head start. 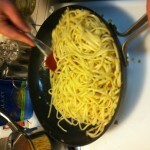 Add cooked linguine to the skillet and toss. 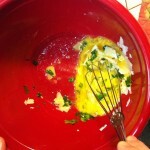 In a separate bowl, whisk eggs, cheese, parsley and pepper together and whisk in 1/4 cup of pasta cooking water. Toss with pasta until creamy. We're in the spirit to celebrate Summer in hopes of inspiring the sun to appear in San Francisco and burn off the marine layer! 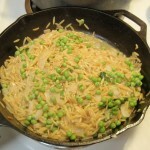 The following recipe for Toasted Orzo with Peas and Mint jumped off the page when we flipped through America's Test Kitchen and now it is a house favorite! Really easy and really good. Give it a shot and see for yourself! 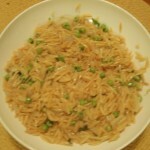 Toast the orzo in a 10-inch skillet over medium heat, stirring frequently, until golden brown. Be sure to keep a close eye on the orzo as it toasts because it may take a moment to get going, but like anything else, once it starts browning get ready to pull the orzo off the heat before you burn the pasta! 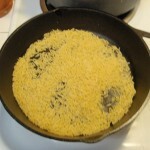 Add the toasted orzo, broth, and water to the skillet; bring to a simmer. 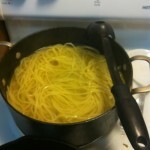 Reduce heat to medium-low and cook, stirring every few minutes (but not too frequently or it will turn into mush) until the liquid is absorbed and the pasta is tender. All told it should take roughly 15 minutes. Stir in peas, mint, lemon juice and zest and ensure the peas are heated through (about 1 minute). Season with salt and pepper if desired and serve. 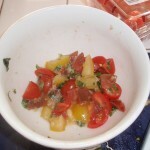 Combine ingredients from tomatoes to basil in a bowl and set aside. 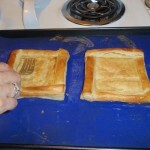 Preheat oven to 400 degrees F. Defrost puff pastry as instructed on the box. 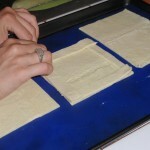 Lay out pastry and cut into even squares leaving one section to cut into 1/4 inch strips for edges. Lay 1/4 strips along the border on each side of the chart. 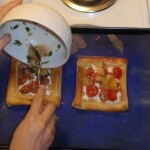 Brush the raised edges of each puff pastry tart with egg-wash (1 egg beaten with 1 Tbsp of water). 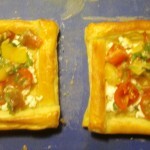 Bake tarts for 20-22 minutes and remove from oven. 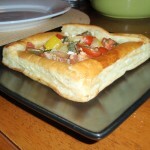 Use fork to gently poke holes and deflate the center of the tart. 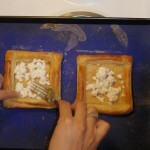 Layer goat cheese in the center of each tart (roughly 1-2 Tbsp, or to taste). Spoon tomato mixture on top of cheese and place in the oven for an additional 5 minutes. Remove and enjoy! 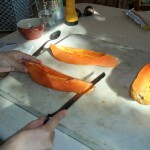 Cut the papaya in half, lengthwise. 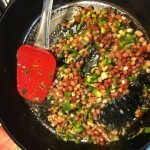 Remove seeds, reserving 2 Tbsp for dressing. 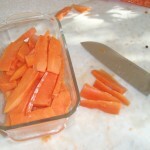 Cut the papaya halves into quarters. Now, carefully, hold fruit firmly to a cutting board and run a thin knife between the fruit and skin to separate. As always, take care to NOT cut towards yourself. 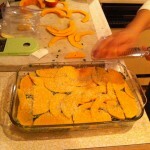 Now cut the fruit on the short side and create 1/2 in thick slices and refrigerate. 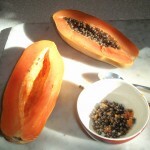 Place the papaya seeds, lime juice, rice vinegar, honey, paprika, salt and cumin in a blender. Blend and slowly add the olive oil, until smooth. 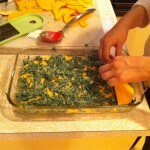 Either using one large serving dish or individual salad plates, and lay a bed of spinach as a base on the plate or plates. 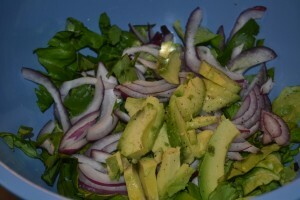 Dress the greens with a few Tsp of the dressing. 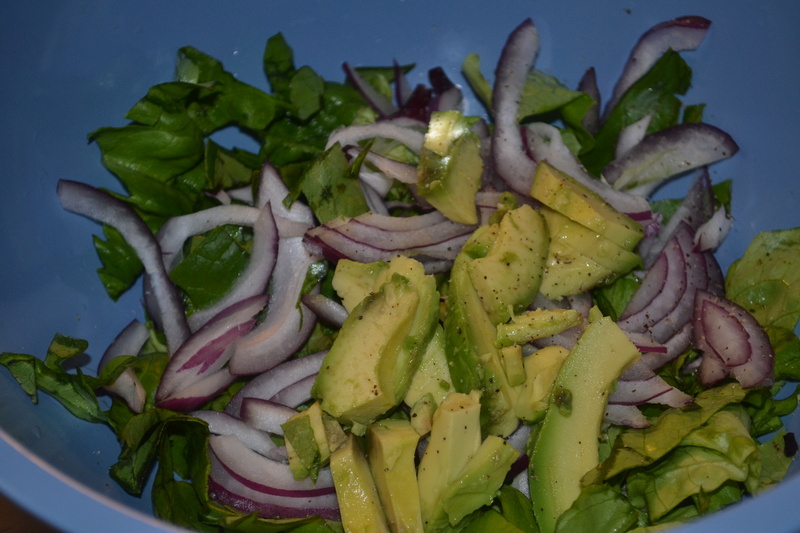 Build the salad by alternating slices of papaya and avocado across the greens. When complete sprinkle the salad with some toasted nuts, drizzle with some additional dressing and freshly ground black pepper. Place remaining dressing on the table for service. 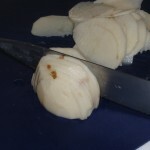 Peel potatoes and slice thinly making sure to be uniform to ensure potatoes cook evenly. In medium to large frying pan heat olive oil to medium-high heat. If you are unsure, try dropping a single piece of potato in the oil and see if the oil is hot enough to fry. 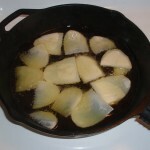 Once the oil is hot enough, place the potato evenly in the oil making sure the oil almost covers the potatoes. Here is a brief video that shows our potatoes frying in the oil. 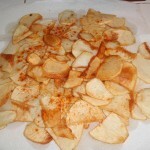 If you are using a medium sized pan, you may have to cook the potatoes in shifts; once the potatoes become soft you can remove them and place them on a paper towel to drain and season with smoked paprika. 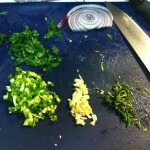 While the potatoes are cooking you can slice up the onion in to 1/4 inch pieces and also prepare the garlic by mincing. Once the potatoes are done use the remaining oil to cook the onion and garlic until the onion is translucent, when ready remove the onion and garlic and spread across your potatoes. It is important to let the potatoes, onion and garlic mixture to cool so that the ingredients can be mixed with the egg without cooking the egg mixture. Next remove the excess oil from the pan, but make sure you still have a nice coat on the bottom to prevent the egg mixture from sticking. Heat the pan to a medium-high temperature to help prevent the egg mixture from sticking to the pan. 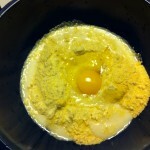 In a bowl, crack the eggs and scramble adding salt and pepper. Place the potato, onion and garlic mixture in to the pan using a spatula to spread out the mixture and try to eliminate any air space between the slices, quickly pour the eggs into the pan and fry the tortilla for about 3-4 minutes lowering the heat slightly. 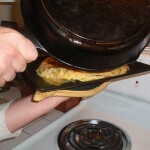 Periodically shake the pan and/or use a spatula to make sure the tortilla is not stuck to the bottom or sides of the pan. 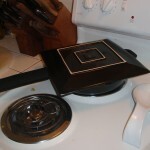 When you are ready to flip, use the large plate you have set aside and lay it upside down over the top of your pan. Make sure everything fits and place your palm on the center of the plate and your other hand on the handle of the frying pan. 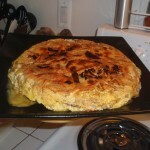 Quickly invert the pan and the tortilla should come right out. Now return the pan to the heat and slide the tortilla off of the plate and back into the pan to finish cooking for another 3 - 4 minutes. If you had any potatoes come loose in the flip, just lift the tortilla and slide them underneath as the loose eggs will pull them back into form as it cooks. 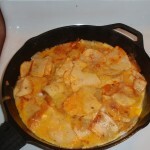 Remove the pan from the heat and let the tortilla rest for a few minutes before removing from the pan. 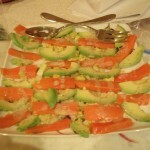 Prepare sliced baguette to accompany the tortilla presentation. Take care to snip the spikes off of the leaves by cutting off the very tips. Also cut the stem off of the artichokes, and be sure to level the cut so that the artichokes will sit flat in the bottom of the pot. Push down on the top of the artichokes slightly to open up the internal leaves slightly. 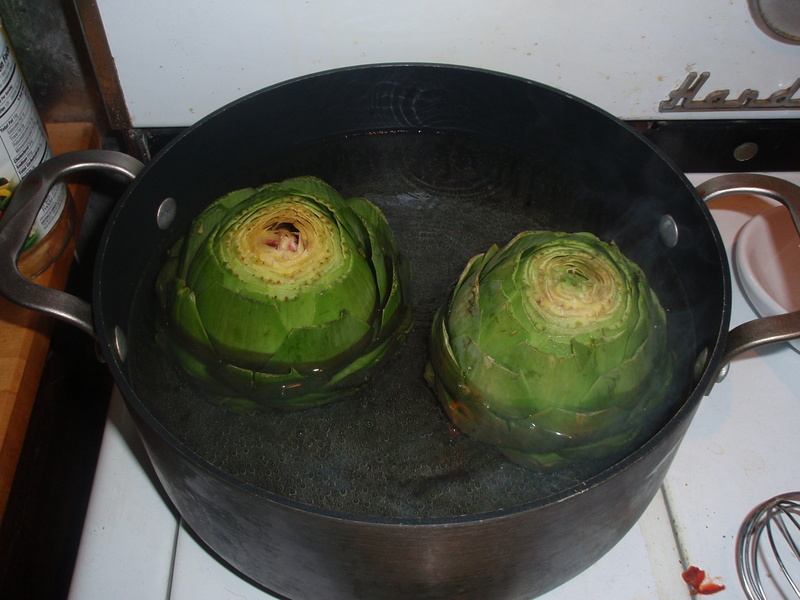 Place the artichokes in a pasta pot and fill the pot with water until the level covers roughly 2/3 of the artichokes. Turn the heat to medium-high and bring to a steady boil for 45 minutes or until tender and leaves can be easily pulled from the base. Cooking artichokes is an inexact science that varies based on size of the artichokes, so as you approach the 45 min pull leaves to see how done they are. Remember, practice makes perfect so fire up artichokes as often as you can and be sure to check out our favorite Lemon Basil Curry Aioli for dipping. 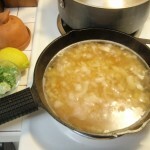 Another option is a basic garlic and melted butter dipping sauce.